When it came to irrigation, the farmers of ancient Egypt, Mesopotamia, and Rome had geography on their side. Civilizations have always sprung up around large bodies of fresh water because of the fertile farmland they produce. Today’s farmers have invested their resources into modern, high-tech irrigation systems that provide hydration to crops being grown across plains, mountains, and even deserts. Urban farmers aren’t lucky enough to have access to large tracts of land, or proximity to the undisturbed freshwater lakes and rivers that make irrigation simpler for traditional farmers. Growing fruits, vegetables and flowers in your window box can feel like a daunting task if you haven’t done this before. 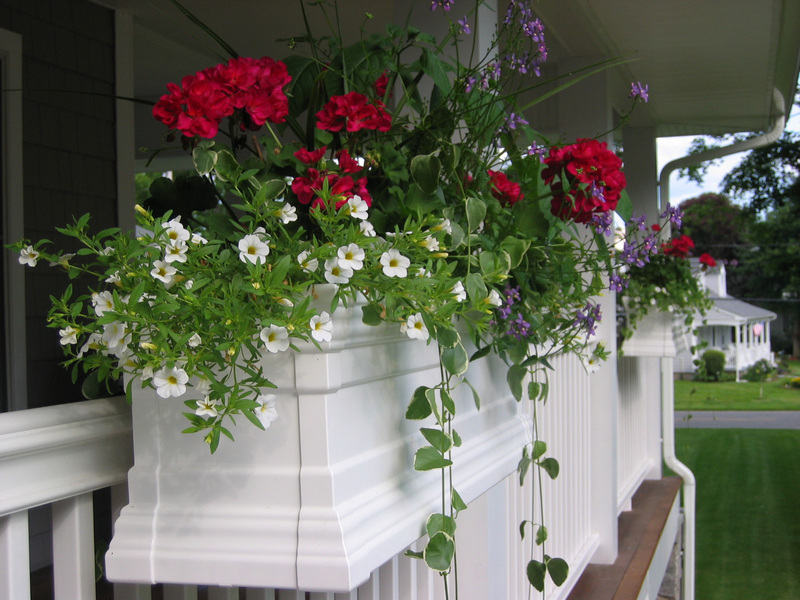 Window box planters are made from artificial containers that don’t allow for proper water drainage. Hot climates, especially in cities, make shallow soil dry out faster. This is especially true when your window box is exposed to direct sunlight. The balcony drip kits listed below are perfect for beginners and seasoned farmers alike. The solution? Look no further than drip irrigation. 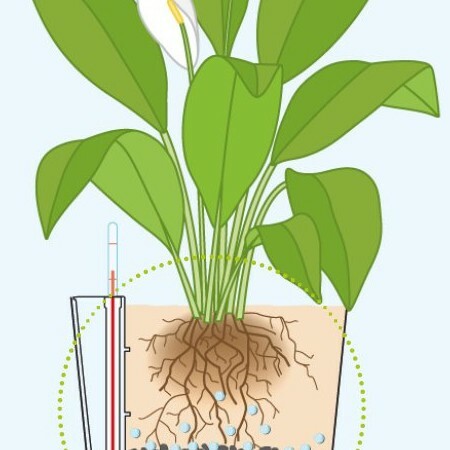 This form of irrigation allows water to slowly drip into the roots of your plants. Water application efficiency becomes very high, and your foliage itself can remain dry. Below are three of the top drip irrigation systems for flower boxes on the market. Balcony drip kit with variable timer. This is an excellent irrigation choice for urban farmers who grow in a variety of different containers in the same vicinity. The circuit system can be set up to water window box planters, flower pots, and hanging baskets all at once. Once turned on, this drip kit exudes a water pressure of an even 14.5 ps, perfect for urban gardeners who strive to conserve water. Oasis self watering kit. Are you worried that your urban garden may require numerous drip irrigation systems? If you have less than 20 plants, don’t fret. This kit operates on one 9V battery and is ideal for balcony, patio, or small-scale gardening in city plots with other farmers. Basic drip kit. If you’re not in need of a timer, then you may want to consider this simpler version of the balcony drip kit. The amount of water dispersed throughout each planet can still be calibrated – you can choose for plants to receive between 0 to 1.59 gallons of water per hour. All of these drip kits come with instructions for urban farmers who may be setting up drip irrigation systems for the very first time. As with all irrigation techniques, make sure to calibrate each planter box according to the specific watering needs of each plant. Year-Round Gardening Tip: Rotate flowers throughout seasons for uninterrupted splashes of color! There is something about a hanging basket that is simply magical – the overflowing branches, the bright flowers, and the charming containers make for a perfect combination and a great addition to a yard or garden oasis. 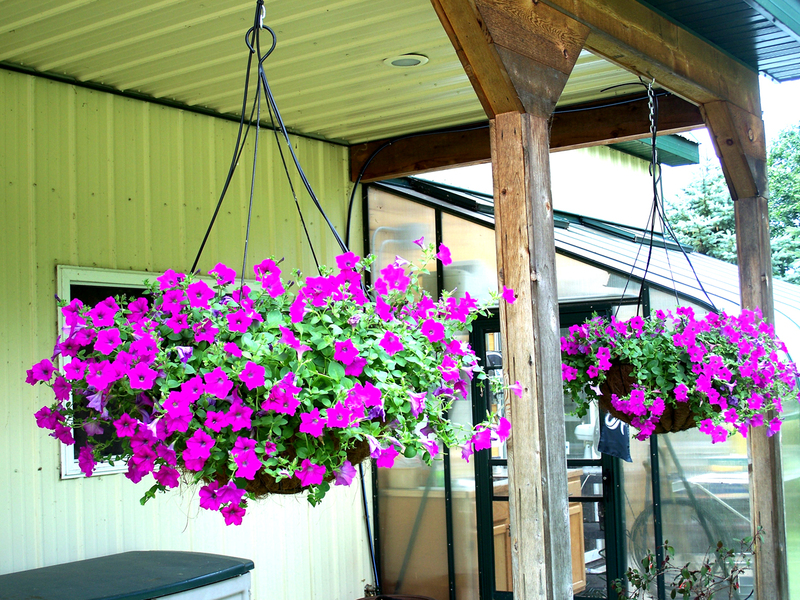 Add some height and pizazz to your home with beautiful hanging baskets in year round containers. You don’t need a lot of space to instantly increase your curb appeal and green thumb credentials. 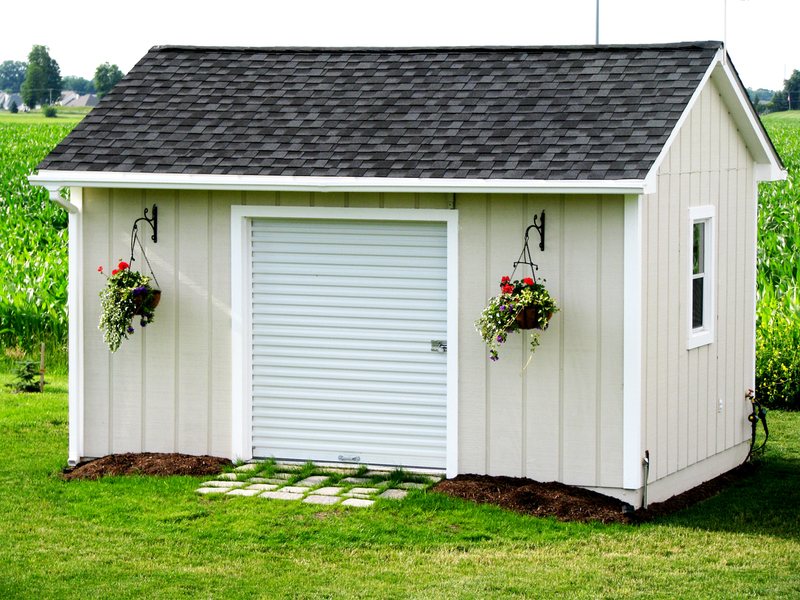 12 inch Hanging Baskets are the perfect size for this small shed. The decorative wall brackets are a nice touch! Start at the beginning by picking the right basket. Outdoor hanging baskets come in lots of styles. An important factor is the size. A too-small basket means watering more often and a too-big basket can get heavy. For beginners, opt for a medium sized basket that will allow room for your plants to grow and also retain moisture. The biggest piece of the basket puzzle is picking the right liner. This English Garden Flat Steel Hanging Basket comes with a coconut coir liner to keep plants moist and promote lush growth. Other liner options include burlap or moss. For a truly unique look, combine the liner with the basket for a show stopping moss planter, like this Ashton Moss Vine Hanging Basket. Now that you have your year round containers, what should you put in them? 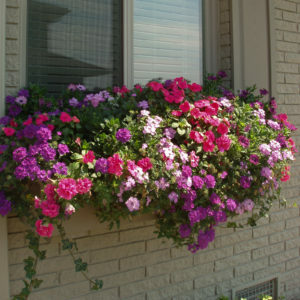 Hanging baskets can be used year round with a variety of plants. For a longer lasting look, go for hardy classics like pansies or cyclamen. Otherwise, you can rotate through flowers with the seasons or choose plants that will bloom during your favorite part of the year. Popular spring and summer options are fuchsias, geraniums, and trailing lobelia. In the fall and winter, viola ochre and other solanum plants are great choices. For a colorful look year round, go for an evergreen plant like buxus or ivy. 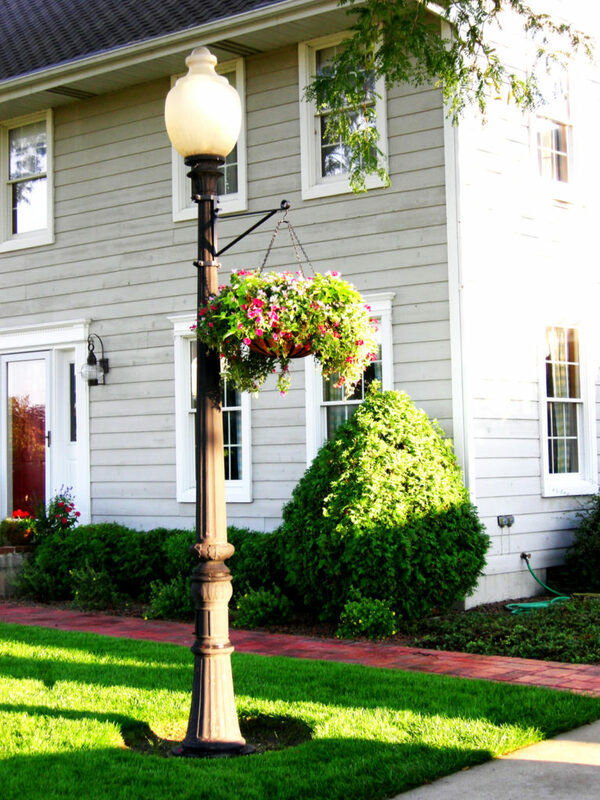 This lamppost and 22-inch hanging flower basket combination are truly a curb appeal home run! Brackets are custom-made for the perfect fit! A typical outdoor hanging basket features trailing plants, mid-level plants, and tall plants. Pick a few blooms for each section so you don’t overwhelm yourself or your planter. Match the look of your plants to the style of your hanging basket. Earthy colors and textures are a great compliment to a moss planter. Dressing up a boring wall is easy with a decorative scroll bracket and a hanging basket with trailing vines! Once everything is in place, you are ready to plant your hanging basket. Fill your basket half full of potting soil and mix in a quarter cup fertilizer. This ensures your plants have nutrients even after the water drips out. Press the base layer of soil to create a solid foundation for your plants. If using a deeper basket like the classic Scalloped French Wire Basket, make sure your plants have enough room to grow roots. To maximize space, place hanging plants around the outside of the container, then work your way towards the middle with the taller plants. After the quick and simple process is complete, your outdoor hanging basket is ready to be hung anywhere around the yard and enjoyed all year long! Shown: Mariposa Hayrack Trough Window Box with Coconut Liner and beautiful purple flowers; sent in by Alissa D.
Spring is just around the corner and with the change of seasons comes the opportunity to spruce up your spring garden. Whether you plan on planting a flower bed or are looking for other alternatives, learn more about your available options before spring finally arrives. Keep reading and you will discover early spring flowers and window planters that you will fall in love with. Betty G. painted her XL Catalina PVC Window Planters to match the exterior house paint. Her container garden continues to flourish! 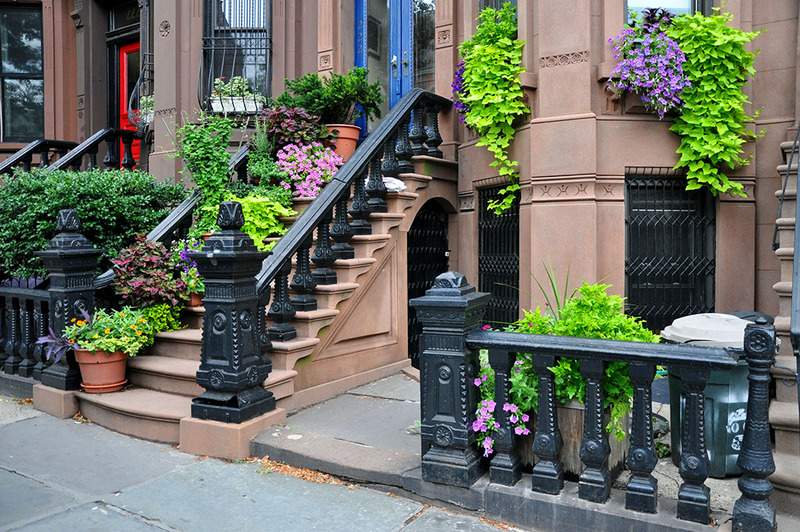 When planning the arrangement of your flowers and garden, do not forget about the outside of your house. Window sills are a great way to add charm to your home. Planting a flower bed is one thing; though, why not work your way up your home by installing planters along your window sills. Kara’s successful balcony garden of early spring flowers has Medallion Decora Window Boxes to thank! Just because you have a small yard does not mean that you are out of options for your spring garden. Many people forget about decorating their actual house when planning their home gardening projects. 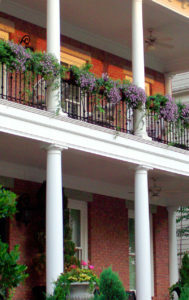 Planters and flower boxes will hang on the outside of your windows, requiring no yard space. This is a beautiful way to add to the appeal of your home. No matter what style of home you have, there is sure to be flower boxes that will match the look of your house. For example, for a modern home, consider purchasing contemporary window boxes. With hundreds of options to choose from for your plants and flowers, spend some time browsing your options to match the aesthetics of your home. To go along with your black shutters, you can purchase wrought iron flower cages. Using simple curves, an iron flower cage makes a beautiful showcase for the plants that you have chosen. Other options include wooden boxes, such as red cedar planters. No matter what you choose, you are sure to add to your curb appeal. 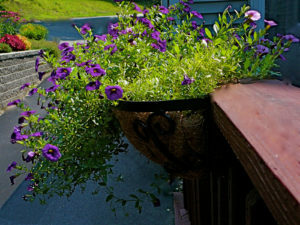 Another spring flower success story thanks to Royal Vinyl Window Boxes. Your window sills are not the only location that you can install bases for your flowers. They can also be installed along fences and even the side of your home. When you are deciding on your planters or boxes, think outside the box and consider the outside of your home one large canvas. While the flowers that you plant may not last through the winter, the durable window planters that you install can be used year after year. Always choose quality material that can resist weather conditions. Being outdoors, they will have to deal with plenty of rain and wind. Once you start populating your garden with your selection of flowers, you will truly enjoy spending more time with your family outdoors. Hooks & Lattice now offers consultation for those of you who aren’t sure what to get. Call toll free 888-896-0978 to speak with our Design Department today about which window boxes fit your home’s architectural style. Mix different kinds of succulents for a colorful window box. Image from flickr. Are you dreaming about adding some window boxes to your home, but lack the time and patience to pamper persnickety flowers? In the last few years, succulents of every shape and size have made their way into gardens and homes across the country, with a few setting roots in window boxes on the shady sides of homes. If you’re looking for a low-care option for your window boxes, succulents may be the answer. These plants offer interesting textures for your inner designer to mix into endless combinations and the occasional flower stalks for an unexpected splash of color. Succulents are very unlike other plants you have grown in the past, and unlike their cousins the cacti, they don’t generally tolerate bright, direct sunlight. Their ability to tolerate drought sets them apart from more standard nursery offerings. That’s not to say that they can live without water, though. This common myth has led a lot of beginning succulent gardeners down a road paved with disappointment. Most succulents prefer moderately lit, warm and well-draining locations – if you design your window boxes with these requirements in mind, you’ll soon be graced with happy, healthy succulents. Choose a composite window box with lots of drainage holes – succulents will absolutely not tolerate wet feet! – and fill it with a commercial cactus medium. Avoid heavy, rich soil mixes, these will only increase the risk of disease and attract pests. If temperatures in your area dip below 40 degrees Fahrenheit for any significant amount of time, you may want to plan for smaller window boxes that can be brought indoors during the winter. Regardless of the size of your container, plan to water deeply once a week until October, when most succulents begin to go dormant. Combine trailing succulents and tall succulents for an impressive display. Image from Paradis Express. Slow-growing succulents can be packed tightly into window boxes for a very full look or spaced further apart with small stones or glass pebbles serving as a decorative mulch and doubling as anchors. Many people plant taller, larger succulents in the back of their window boxes and creeping succulents in the front to create a many layers of texture. Generously flowering creepers like ice plant and moss rose combine the texture of succulent foliage with bold flowers for a unique look as they spill over the edge of your boxes. Although many gardeners like to mix it up, planting many different shapes, colors and sizes of succulents in the same window box, there is merit in a repeating pattern. Like tulips neatly arranged in a planter, a tidy row of Aeonium, Aloe, Echeveria or Pachyphytum can bring a sense of order to a more formal home or landscape. Another neat trick is to arrange multiple levels of window boxes using stair risers for support. 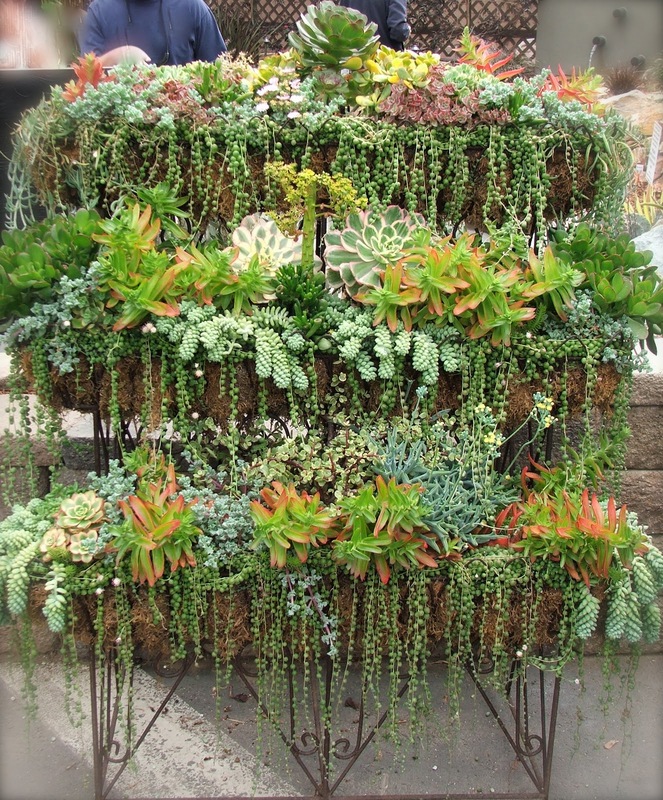 If you plant cascading succulents in the front of each box, a waterfall effect will eventually emerge to tie the many levels together visually. 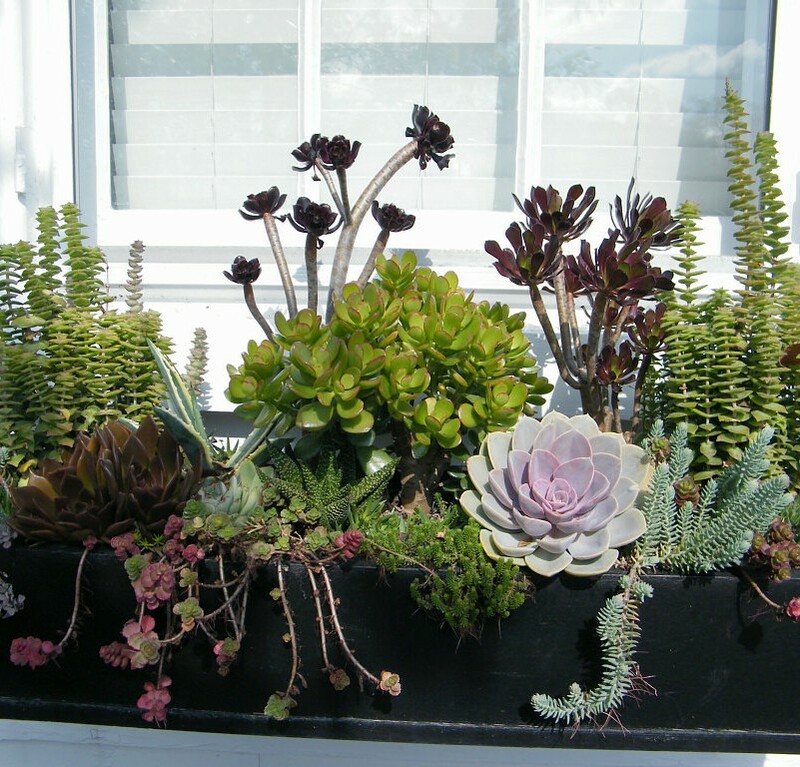 As long as your window box creations aren’t too wide to water properly, the sky’s the limit with succulents! Self-watering planters have a reservoir of water beneath the soil. Watering is one of the most vital and detested chores in the garden, right after pulling long rooted, thorny weeds with your bare hands. For container gardeners, watering has become much less of a hassle since the introduction of the newest generation of self-watering planters. Older styles of self-watering planters weren’t much better than resting a pot in a saucer, but today’s self-watering planters contain separate water reservoirs designed to protect plant roots from excess moisture. The heat of the summer makes container gardens particularly needy when it comes to water. The high heat, low humidity and small amount of water-trapping planting medium means that containers dry out significantly faster than garden beds. In many areas, containers need to be watered two or three times a day, especially when vegetables are involved. In response to this sort of problem, the reservoir system was developed to allow gardeners a break from constant watering. Whether you’ve got a busy life that keeps you on the run or you’re a notorious under-waterer, self-watering planters will help you to grow a wider range of plants than ever before. Depending on the size of the plant, the pot and the reservoir, you may be able to go a week or two between waterings, turning a daily chore into a weekly task. Furthermore, self-watering containers tend to save a lot of water, since the water that isn’t used immediately by your plant is stored for later use. Self-watering planters have a very simple design and work on basic concepts. A plastic, hollow platform rests in the bottom of the pot to create the reservoir. The top of the platform is solid, with one or more holes to allow water to drain from the plant’s soil and collect underneath. Some self-watering planters are additionally fitted with watering tubes that protrude from the top of the soil once the pot is filled with medium. Others also have an overflow hose to prevent standing water above the platform. The water that’s trapped below the plastic platform is dealt back to the soil through wicking, or “capillary action,” gently hydrating the growing medium. You may find advertisements that claim your plant will get exactly the amount of water it needs from this system, but keep in mind that the self-watering pot isn’t magic. They do deal back an average amount of moisture for an average plant under most conditions. This means that plants that need very dry conditions or those that require boggier soil won’t do well in self-watering pots, but your standard garden vegetables, annuals and many perennials are excellent self-watering container candidates. You can purchase self-watering planters from just about any home and garden retailer, and we have quite a wide selection right here at Hooks & Lattice. If you already have a planter you love, transform it into a self-watering planter by adding a reservoir beneath the soil. You may even be able to exercise your DIY skills and create one from scratch. Whatever method you choose, your plants’ roots will draw up exactly as much water as they need, and you’ll spend less time watering and more time relaxing in the garden. 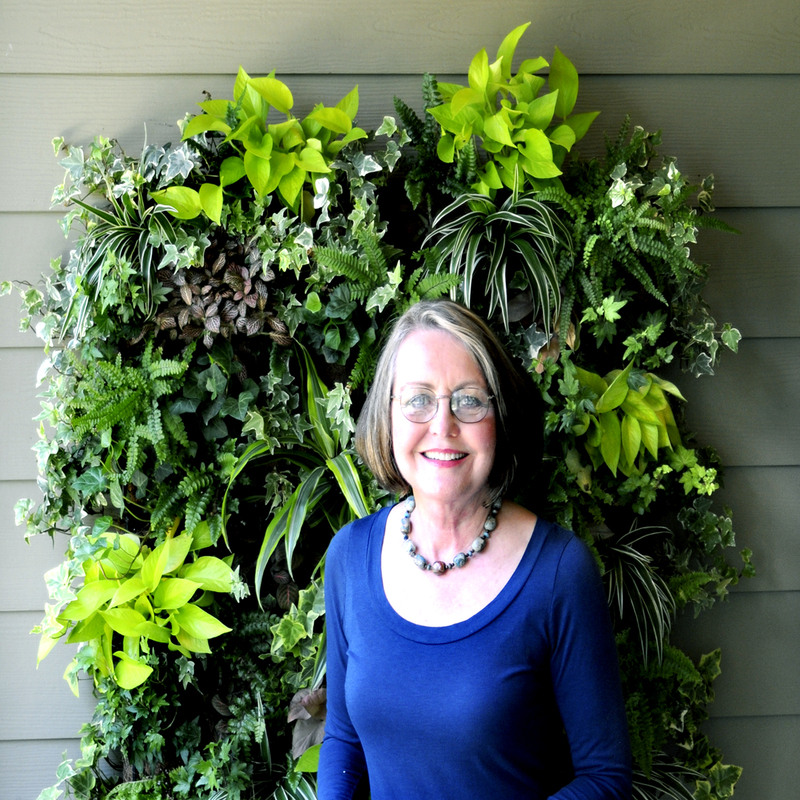 https://blog.hooksandlattice.com/wp-content/uploads/2013/07/how-self-watering-planters-work-e1382651112188-1.jpg 450 450 Kristi Waterworth https://blog.hooksandlattice.com/wp-content/uploads/2017/10/hl-blog-logo.png Kristi Waterworth2013-08-13 11:25:382013-08-13 11:25:38How Do Self-Watering Planters Work? 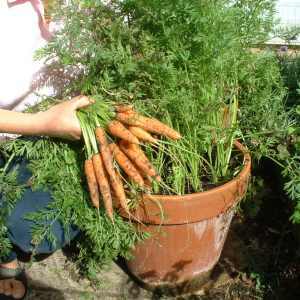 All kinds of vegetables will grow in flower pots, including carrots! Image from Pernaculture for Renters. Vegetable growing can be a lot of hard work – between the beating they get from tilling the garden and the back breaking bending to place each seed or plant in the ground, many gardeners give up and go shopping at the Farmer’s Market. Although this is certainly a viable solution, you still can’t be sure how your veggies and fruits were handled, or what kinds of chemicals might have been applied to them. There is another way: container gardening! Containers simplify the labor intensive preparation required of vegetable gardens in areas with troubled soil and even allow apartment dwellers to grow a surprising amount of food in a very small space. With careful planning and the right containers, you can grow almost any type of vegetable in a planter pot, flower box, or hanging basket. Before you plant your first tomato, pepper, bean, or onion, think about the spaces around your home where a planted container might fit. Small plants with upright growth like bush beans, carrots, beets or lettuce may fit nicely into an extra wide window box. A mixed planting of veggies can be every bit as pretty as flowers. Big hanging baskets are great for vining or tumbling plants like peas, small squash, cucumbers or runner beans. 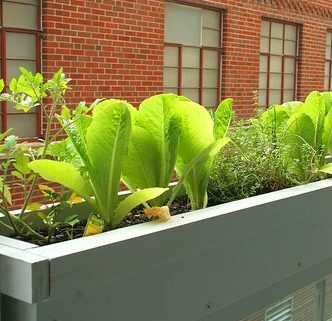 In the city, grow veggies like lettuce in window boxes. Image from Dig Home Designing. The selection of potting medium is vital to your success with container gardening. Starting with a sterilized, premixed general potting soil with slow release fertilizer is ideal, though experienced gardeners may choose to mix their own from a variety of sterilized mediums. Worm castings are a common addition to a basic soil mix, helping your container garden retain moisture and improving soil structure. Veggies in containers don’t usually need to be weeded and soil-borne pathogens are rarely problems, but they do require some special care. Since your plants are growing in a very small, limited area, they are going to need you to give them everything it takes for them to survive. Watering, fertilizing and careful pruning will ensure that your plants are all they can be. Every plant needs water, but a container plant may need to be watered as much as three times a day in the summer. Check the soil a few times a day by sticking your finger in as deeply as you can. If it feels dry below the first knuckle, water the container evenly until water runs out the bottom. Try not to get water on the leaves, since this can invite problems with fungal disease. You can even grow vegetables in hanging baskets! Image from Love Apple Farms. All that watering will drive the nutrients from the soil, which is why a slow-release fertilizer in the mix is a nice bonus. If your plants are starting to produce lighter colored leaves, or just don’t seem quite right, a half-strength dose of water soluble 10-10-10 fertilizer mixed into the watercan may help. Don’t fertilize more than once a week, unless your plants are obviously struggling, and then only do so after performing a soil test. If frequent watering seems like a challenge, consider a self-watering planter. You can turn any planter into a self-watering one by adding a reservoir. It will hold excess water at the bottom of the planter, and the thirsty plants will pull it up into their roots when they need it. Some plants, like tomatoes, do better when they’ve been pruned heavily. It may seem counter-intuitive, but if you want big, fat tomatoes from your containers, limit the number of secondary shoots and pinch out excessive growth. Thin other plants, like carrots and lettuce, after seeding to give the strongest plants a little more room. 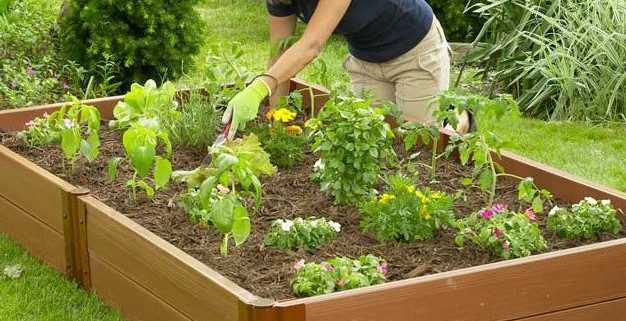 A composite raised bed garden kit includes everything needed. We all imagine that our gardens will be beautiful, thriving oases of green, springing right out of the ground, but it’s not always possible without a great deal of hard work and manipulation of native soils that may be full of clay, rocks or sand. Enter the raised bed garden! Whether you need to raise your beds just above the ground and start with fresh soil, or bring your garden up to a height where bending is no longer necessary, raised beds may be the perfect solution to your gardening problems. Raised beds are great in areas where the soil is difficult to work, or when you want to add an elevated feature to your landscape – kits are available to build complicated garden shapes that can be useful to segregate herbs in gardens or aggressive plants that may escape a traditional garden and run wild. When you build a raised bed, you have a unique opportunity to tailor the soil conditions to the plants you intend to grow, rather than having to force those conditions onto soil that may be resistant. Many gardeners prefer to use raised beds for vegetables and small fruits, since they can be caged with strong wire to protect seedlings and young transplants from wild animals. Sometimes, gardeners build custom-fit plastic hoop houses for their raised beds – when properly designed, these additions allow gardeners to get a jump on planting, since they act like tiny greenhouses. 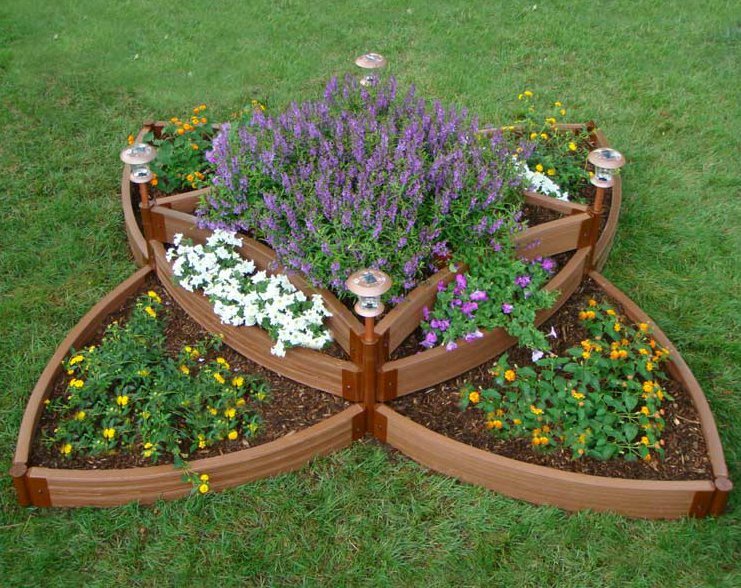 Raised garden beds can take fanciful shapes. Unfortunately, raised gardens don’t function exactly the same as plowed garden plots, and may sometimes require a great deal of manual care, especially when the time comes to clean up dead plants after harvest. Instead of plowing plants back into the soil, it’s often less disruptive to pull them out of the bed, leading to significant time investments. Of course, if you only have a few beds, or your raised bed plants are perennials, this isn’t a concern. 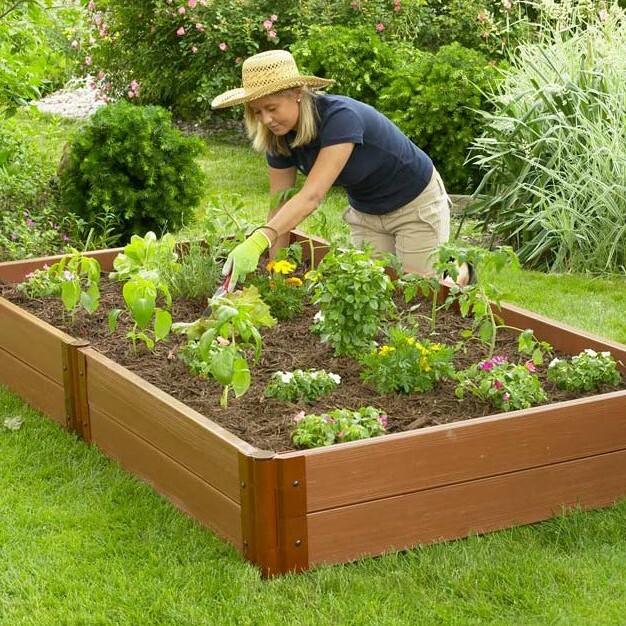 The size of a raised bed is limited by your ability to reach across it, and, in the case of a raised garden on legs, the weight of wet soil. This is why raised beds are rarely more than four feet across – most people can reach two feet into the bed from either side. You must be careful to prevent soil compaction caused by walking or leaning on the soil in the bed, or plant roots may have trouble penetrating. In addition, a bed that’s only four feet wide shouldn’t be expected to accommodate anything bigger than a four or five foot wide bush, limiting your planting options. Planning and setting up your raised beds is a precision task, though one easy enough for a homeowner with a few simple tools. The most important part of planning is choosing your bed’s location – after all, they’re not exactly easy to move once constructed and filled with soil. For example, you would place a raised bed intended for vegetables in a location that gets at least eight hours of bright sunlight each day, instead of in a spot that suddenly becomes shady when the trees leaf out. Many people start their first raised beds with commercial kits containing cedar or composite boards and specially designed joints that ensure their garden comes out perfect. You can prolong the life of your garden by placing the frame on top of a geotextile fabric that will prevent perennial weeds from working their way up through the soil. Never use black plastic, as this material can cause drainage problems under raised bed gardens. Once in place, you need only fill your bed with lots of rich, well-draining soil and pop your plants into their new homes. You can even build trellises over the beds to allow vining plants to climb unhindered, or train them into a central arch that runs between two beds. Raised gardens allow nearly endless possibilities for a gardener with a creative streak. https://blog.hooksandlattice.com/wp-content/uploads/2013/06/composite-raised-bed-garden-e1383066779323-1.jpg 626 626 Kristi Waterworth https://blog.hooksandlattice.com/wp-content/uploads/2017/10/hl-blog-logo.png Kristi Waterworth2013-06-20 14:59:232013-06-20 14:59:23How Do You Build a Raised Garden Bed? It’s important to water smart during the summer. Summer is a great time for family vacations and trips to the pool, but it can be a huge challenge for gardeners. Vegetable plants get touchy when temperatures climb, flowers collapse and the lawn might even take on a slightly brown tone. 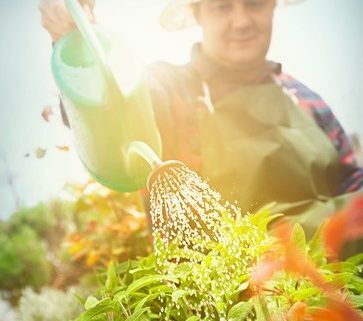 Depending on where you live, summer may be the most difficult season for your plants, but if you follow these summer gardening tips, you can protect them from the worst of the heat. Water is the most important thing you can give your plants in the summer, provided you give it at the right time and in decent amounts. Put away the sprinklers unless you mean to water your lawn and go after your plants with a hose with a sprinkler wand attachment or run a soaker hose through your bigger beds. Water each plant at its base until water puddles, in the morning, two to three times a week. You can further enhance your soil’s water holding capacity by applying two to four inches of organic mulch to bare ground, even in the vegetable garden. Not only does mulch help retain water, it keeps soil cooler by shading it from the harsh rays of the sun. 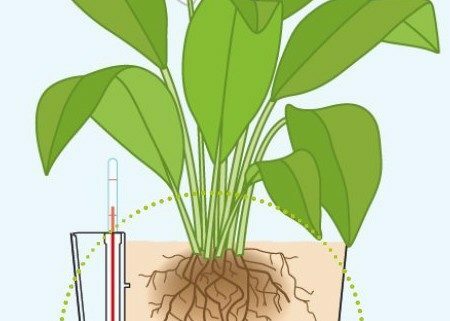 Cooler soil means cooler roots, increasing the odds that your plants will survive a heat wave. If a drench every few days is still leaving your plants wilted during midday, check the soil moisture with a meter, or use your finger to probe the top two inches of the soil. If it feels dry to the touch, increase your watering frequency. 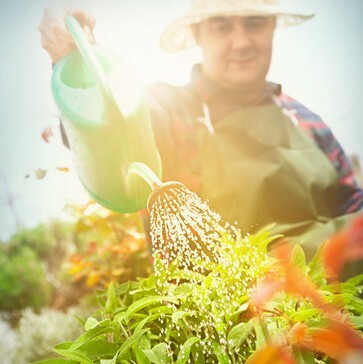 Resist the urge to fertilize your plants if they are showing any signs of heat stress – until they are sufficiently rehydrated, fertilizing can be damaging. 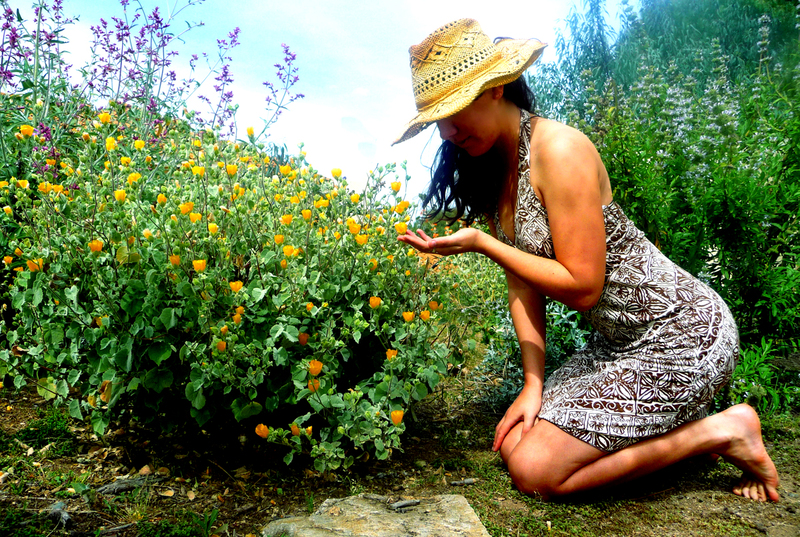 Summer is the season for weeds. They really get going about this time, so make sure you’re pulling any new invaders at least once a week. Summer weeds grow fast and set seed before you know it – if you put this chore off, you will regret it. While you’re at it, check the plants nearby for signs of pest insects hiding on the undersides of leaves. Flowers and fruits need attention. While you’re weeding, make sure to remove any spent flowers or those that are starting to fade. Also make sure to pick your vegetables and fruits in a timely manner to discourage spoilage – it attracts a host of pests and diseases. Check food plants over for deformed fruits and remove them on sight to allow the plant to focus its efforts on growing the healthy fruits. Don’t forget your containers! Containers need water at a much greater rate than your garden plants, make sure you’re checking them frequently. If the soil feels bone dry, you may have let them go too long – water the containers as soon as possible and increase your watering frequency until temperatures cool a little. Plant heat-loving annuals. Early summer is a great time to refresh your garden with annuals that love the heat. As your spring bloomers fade, these summer annuals will be ready to take their places, disguising browning foliage and empty spots in the landscape. A few of our favorite summer annuals are listed below.